Are you planning a web site in German, Greek or Gujarati (or any other languages)? If so, then Kielder Multilingual Media has the expertise to produce the high-quality websites that you require, no matter what the language. Our experts can deal with all the issues involved with translating your website into other languages, including any re-sizing required where translated text is longer than the original. We are skilled in dealing with the right-to-left languages like Arabic. 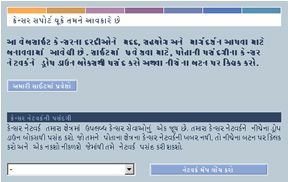 We have proven experience of converting websites into languages with different scripts like Japanese and Gujarati. We look forward to working with you in creating websites in whatever language you require, or in helping with production of multilingual audiovisual materials. Please see information on other services provided by Kielder Multilingual Media.